The Warwick Rockbass Corvette $$ Bass has and Ash body and Maple neck to deliver bright warm tones, with a Rosewood fingerboard to smooth out any sharpness. 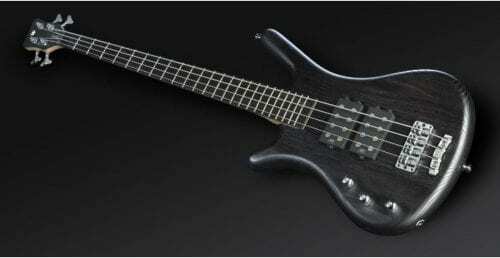 The bass features a set of MEC humbuckers that produce thundering tones and can be switch between series and parallel. With a Just-a-Nut III and 2-piece Warwick bridge from impeccable string stability, the Rockbass Corvette $$ is an incredible bass guitar, perfect for any bassist’s collection. The Rockbass Corvette $$ features an Ash body and maple neck to deliver bright, sweet tones with a pleasing sustain, and a Rosewood fingerboard to smooth out any sharpness. The bass has a set of MEC humbuckers to produce rich and dynamic tones, with push/pull switches to change between parallel and series. A Just-a-Nut III allows the string height to be adjusted at the nut and offers impeccable string stability, whilst the bass’s 2-piece Warwick bridge allows for individual string adjustments and its break angle improves tone and intonations. The Corvette has a Swamp Ash body that produce bright, sweet tones that are airy and have plenty of cut. The body produces a hard hitting sound that has a twangy feel for firm lows, pleasant highs and a slightly scooped midrange. 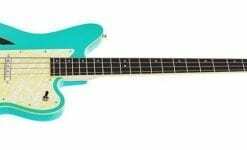 The bass features a Maple neck to give the tone bright characteristics and punch, and a Rosewood fingerboard to deliver a warm, soft tone. The Maple and Rosewood combination provide a solid, thick low, a sparklingly sizzling high, and a snappy midrange attack. 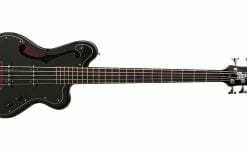 The Corvette Double Buck Bass features a set of MEC MM-style humbuckers situated near the middle position to hit the “sweet spot” of the bass. The MEC humbuckers use ceramic bar magnets to produce rich tones that have a strong punch and sharp bite to create dynamic characteristics. 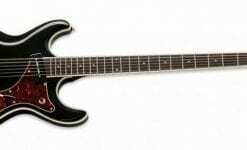 The bass has three controls for the humbuckers, with two volume controls and a tone control. The volume controls also double as push/pull switches for changing the humbuckers between series and parallel. On series, the humbuckers have a higher output and produce a full tone, whilst parallel produces a bright tone with a low output. Warwick Rockbass produce affordable versions of Warwick instruments, creating copies using less exotic materials. Although they are made from more affordable materials, Warwick Rockbass produce high quality instruments ideal for musicians with a tighter budget that still desire quality.